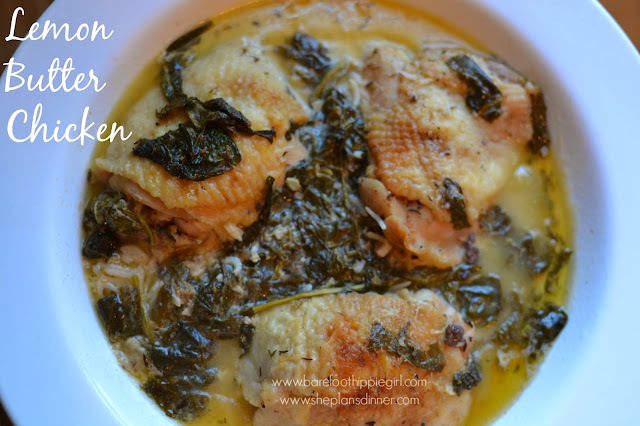 This recipe that I have for you today gave me a chance to try a new technique. This technique involves browning stuff in an oven safe skillet on the stove top, and then putting everything in the oven to complete the cooking. I don't think I have ever done that before. I've browned stuff and put it in the crock pot, but never in the oven. It is a recipe totally made for a colorful, beautiful oven-proof skillet. 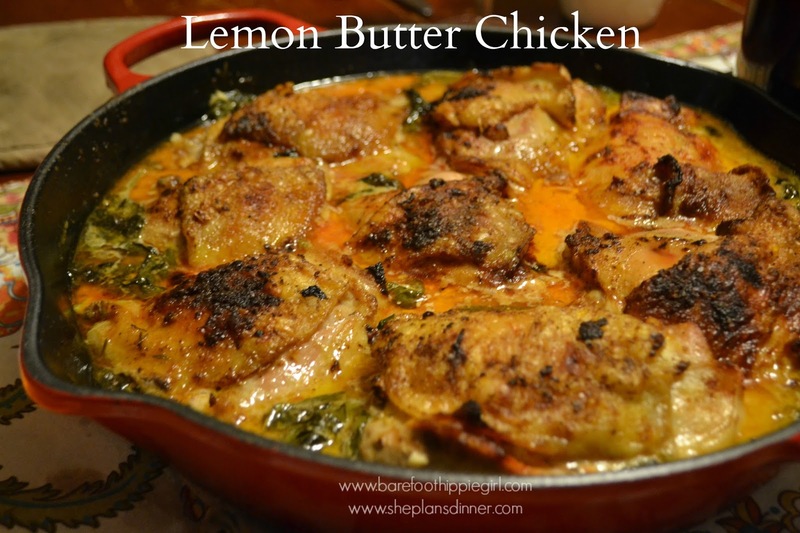 So, the recipe...It's Lemon Butter Chicken. Lemon and Chicken is a very Greek flavor combo. And it's one I love. This dish was delicious, the preparation was a snap, and the chicken was tender and moist. So good. I'm not exactly sure why the skin stays on. I might try making the recipe sans skin. Though Meres is a total skin eating fanatic. It's her favorite. She eats her own, and asks for everyone else's too. I personally am going to up the lemon juice next time around also. I think a little more juice would make it even better. But, maybe it will make it worse. I'll let you know. -Season chicken thighs with paprika, and salt and pepper to taste. 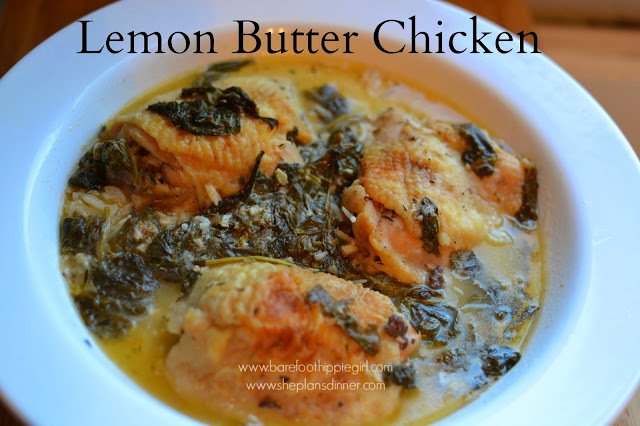 -Melt 2 Tbsp butter in a large oven proof skillet over medium high heat. Sear both sides of the chicken until gold brown 3-4 minutes per side. Drain excess fat and set aside chicken thighs. -Melt 1 Tbsp butter in the skillet. Add garlic and cook until fragrant, about 1 minute. Stir in chicken broth, heavy cream, parmesan, lemon and thyme. Bring to a boil. Reduce heat. Stir in spinach, and simmer until the spinach is wilted, about 3-5 minutes. Return chicken to the skillet. -Bake in a 400 degree oven for 25-30 minutes, or until the chicken is cooked through. -Cook rice while the chicken is baking.